“Nasi tempong” is the name of the typical foods which are derived from Banyuwangi, East Java, which consists of a collection of some rice and boiled vegetables and a side dish of fried tofu. “Nasi tempong” has a distinctive characteristic with fist-shaped rice which is smothered with peanut sauce that has a sense of kencur. 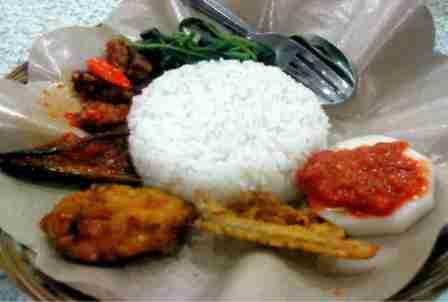 This food is called as “nasi tempong” because it is so spicy that can make people to cry like a slap when they eat it. These foods can be used as daily food that can you found in food store in Indonesia. This dish is served with bakwan corn, yellow fried tofu, and salted jambal fish. It feels more solid with a salad of leaves marigolds, leaf spinach, basil and chunks of cucumber plus steady spicy sauce. If you want to make this dish for your family, below is a recipe of how to make “nasi tempong” easily. After that, pour the water and add the half cooked vegetables and finely sliced corn. Add sugar, salt, flavorings, pepper powder and coriander powder and then mix it well. Finally, you can serve rice ball on a plate and add the vegetables, fried tempe, tofu and jambal fish bread. You can flush it with spicy peanut sauce and seasoning sauce as much as you want. “Nasi tempong” Banyuwangi is ready to be served. This recipe may be able to help mothers who are confused in creating the new menu for the family. You can try this simple recipe at home easily. That’s our article about Nasi Tempong Recipe.